Pocket Revolves is a gun app. Why would you want one? Maybe a bit of fun, I don’t know. There seems to be millions downloading similar types of apps. A reader pointed out one such video yesterday by popular youtubers, smosh (I think it might have been a spammer as they kept trying to post the same video) where they use a gun app to shoot down the rogue Siri. This app however isn’t touch alone. You can swish the phone horizontally to reload and move forward or flick forward to shoot. It will make gun sounds according to the gun selected. You don’t have to flick it as harshly as I did in video, the accelerometer is sensitive enough to detect even a light flick. I think it’s better than having touch as you can make that kind of shooting-recoil action to fire the gun. I think little kids (your own, or cousins etc) might find it fun. Something to annoy your pets perhaps. You might play a game of virtual Russian roulette, eh? I think that’s the purpose of the bet mode but I didn’t know that’s what it was for. And I guess you bet bullets, win them if you get it right and then once you’ve reached a certain amount you unlock more guns. I thought it might be cool if you could somehow make this a multiplayer game. Not sure how the sensors would work to detect if you were shot. It might have worked if we had the old infra-red, eh? Whats New in Version 1.5? – Now, you can get new revolvers ‘Colt Anaconda’ through paying the bullets. – New ‘Gambling mode’ will help you get more bullets. – New Gun Shot SFX. – This revolver simulator has realistic muzzle flares, smoke effects, shocks, and recoils. There will possibly be new stuff appeared in the next update. Perhaps more, but that is all I can tell you thus far. You would like to have fun with your friends? You are looking for jollies? You need adrenalin buzz? Our game will help you! 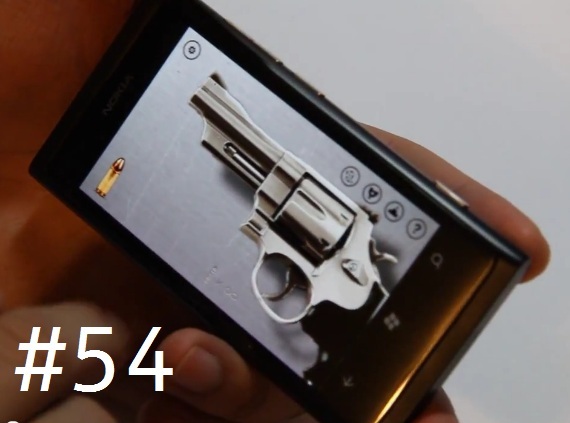 It’s the most beautiful and realistic revolver simulator on the Windows Phone 7! After you enter the game you will see high-quality and well-detailed graphics. Featuring both shake-to-fire and shake-to-reload. Awesome drinking game. Who pays for dinner? Who’s the unlucky one? Pocket Revolvers gives you a fully digital, non-lethal reproduction of a chrome handgun. Not only can you spin the cylinder, but you can selectively fill it with up to six bullets and fire them with a realistic, resounding shot by touching the trigger or shaking the Windows Phone 7. In the preferences screen, you can take full control of your revolver by choosing whether it should vibrate upon shooting, auto reload when the cylinder is empty, fire when you shake your device, or hide the bullets. You can choose if which side you want the speaker to be on by rotating your phone, Pocket Revolvers will rotate correctly. The app should not be used in a public setting, as the realistic sounds could be mistaken for a real weapon. As a rule, Pocket Revolvers should not be used within earshot/sight of anyone who isn’t aware that it’s an application. Needs some info on what certain bits are for. Plus it would be nice if accelerometer gestures for firing and reloading were on by default. « Nokia Conversations Counting Down to CES. Nokia will be there ‘in full force’.